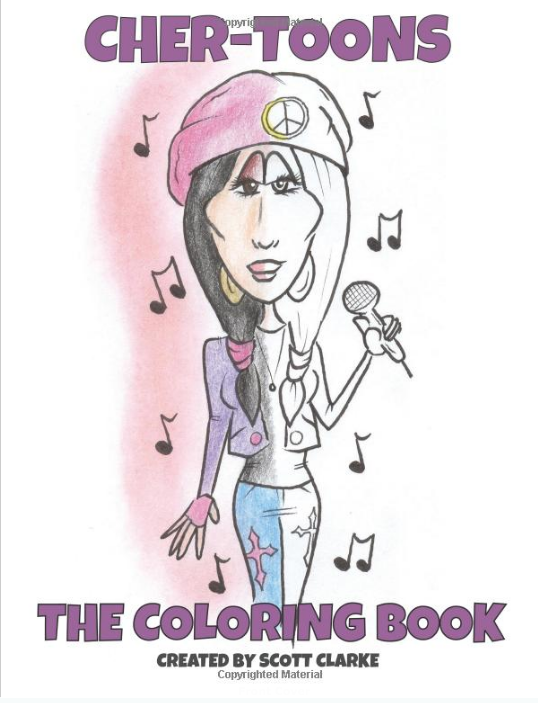 Today we're featuring an interview with Scott Clarke, artist and longtime CCA supporter who has created a set of books, one of "Cher-toons" and one "Cher-toons" coloring book that benefit CCA every time you order! We are so grateful that Scott is using his talent to benefit our kids. Read on for his deeply personal journey and be inspired by his kindness in action. Make sure you order your copy via Smile.Amazon.com to boost the donation even more! CCA: Where are you from? SC: I'm from the DC area, I was abandoned when I was 9 months old, left in a field and covered with leaves, found the following morning by some kids playing outside (yes, it's true and a very long story). I was blessed to have been adopted shortly after I was found and from there I was raised in the Annapolis, Maryland suburbs .... a beach community where we grew up barefoot little beach bums. CCA: When did you first start drawing and illustrating? SC: I started drawing at a very young age, I think around 4 or 5 is when it became "serious." I remember copying techniques from a girl who drew well in my 2nd grade class, I would also sit for hours and draw the Flintstones ... I loved the Hanna-Barbera style and it stuck with me even to this day. CCA: What drew you to celebrities and caricatures? SC: When I was about 10 or so I began to draw CHER - I had found a book about Bob Mackie and I would draw the stars in the book and the amazing clothes they were in. 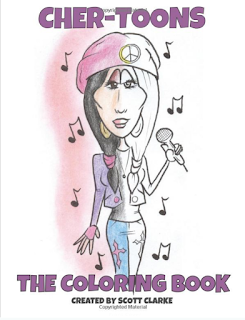 I especially loved drawing Cher because every photo was so different, the hair, clothes etc., always something so cool. I would watch her on TV and draw the scenes etc. I would also draw entire movies out in little books. I remember drawing the Poseidon Adventure once and Gilligan's Island was another I loved to draw from! CCA: When did your art turn into more than just a hobby? SC: About 10 years ago my art turned in to a bit more than just a hobby: I decided to create a greeting card line. I did various kinds, humorous, heartfelt, etc., but then a relative of mine was diagnosed with breast cancer and I felt the desire to do something but wasn't sure what to do. A friend involved in FIND THE CURE campaign asked me to design a breast cancer awareness greeting card...I did and an entire line of them came along! I sold them online for a while and part of the proceeds went to various breast cancer organizations, hospitals, etc. I still have them available on Cafepress I believe. And I share the art on Facebook for inspiration to survivors. CCA: What’s your process like? How long does it take to go from idea to finished illustration? SC: My process is usually about 30 minutes to write the poem and 30 minutes to draw the art. When I first began drawing my caricatures I decided I didn’t want them to be like everyone else’s. I wanted something unique so I began the poems with the art. I usually go with something current in their life, or something they’ve done or a mini bio. I always research the celebrities I draw before I do them: reading, Youtube, old photos etc. It helps with the feeling. As for other art like the CCA things I do, I find a mission statement and work around it with a beginning, middle and end, then add a drawing that fits. CCA: Who are some of your favorite illustrators and artists? SC: MY FAVORITE ARTISTS? Hmmmmmm….I love sooooooo many, I always think everyone else’s work is better than mine and get discouraged! LOL, I don’t think I have a favorite artist … but many styles are inspiring to me! CCA: What’s your favorite illustration you’re done? SC: It wasn’t my favorite because I liked the art so much but the one that made it to Cher’s Birthday Cake will always be my shining moment. SC: What inspires me is people who have nothing and still find the courage to get up every day and smile, Children with mental or physical challenges that move through life without despair and overcome. Elderly people with wisdom, wit and heart to share even after they’ve been brushed aside. I get inspired by those I want to help, even if they don’t need it. CCA: What other hobbies do you have? SC: My other hobbies are boring, I enjoy my gym time, I like yard work, I love music and love to sing (wish I could do it more often). I sang with a band years ago. My art keeps me very busy…not much time for other hobbies! LOL. CCA:What does kindness mean to you? SC: Kindness to me is making someone simply smile and expecting nothing in return. CCA: Why did you agree to help CCA? SC: I had never heard off CCA until I saw the connection Cher had with the organization. Once I learned of it I began to look at it more in depth. Having a young daughter myself my heart was hooked on the organization. My daughter had a cyst in her face as a child, nothing too severe, but I remember the difficult time she had and what she went thru before it was removed. Once again it wasn’t anything so severe that it was life altering but it brought me even closer to CCA and help me see just a small bit of what the parents and children must go through. I wanted to help, and the best way for me to help is to use my gifts (my art) to help with awareness and acceptance. Since I’ve begun sharing my talents with CCA I’ve grown to love these kids I’ve never met! CCA: Name 5 things you'd like to do before you die? SC: Hmmmm….I’d love to see a Broadway Show (no I’ve never seen one), I’d love to sing again, I’d love to get in to inspirational speaking (I survived when I don’t think I was supposed to, and I’d love to help others see they can too), I want an art degree (but I don’t feel like doing the required courses part), I use to say I WANT TO MEET CHER BEFORE I DIE, but NOW I think to myself she should wanna meet me! HAHA! 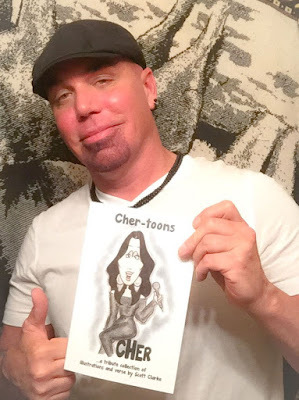 Thanks, Scott, for donating a portion of your sales from these awesome Cher-Toons books to CCA. Get your copy here. Great Interview. Thanks. Love Scott Clarke. You are a true down to the core HERO in my eyes. You have always wanted to make people smile and bring a light into their lives. I am honored to have you as a Facebook friend and admire all that you do for people in this world. Your heart ❤️ is the biggest ever! May God bless and keep you safe. CHER-TOON MADE IT ONTO CHER'S 69TH BIRTHDAY CAKE. + YES... CHER SHOULD ...WANT TO MEET HIM ,SHE WOULD BE GLAD SHE DID.......A GREAT GUY IN A NICE PACKAGE ! Great article! I have enjoyed Scott's talent, humor and witty. This was a great insight into his personal story. I look forward to meeting him in person. Scott...thank you for your support of CCA and breast cancer awareness.